getcalc.com's Normal (Gaussian) Distribution calculator is an online statistics & probability tool to estimate the probability of standard normal variate range such as P(X < X1), P(X > X1), P(X < X2), P(X > X2) or P(X1 < X < X2) in left, right or two tailed distributions. This calculator is featured to generate the complete work with steps for any corresponding input values to solve the continuous probability density function worksheet or homework problems. Normal Distribution is also well known by Gaussian distribution. It's a continuous probability density function used to find the probability of area of standard normal variate X such as P(X < X1), P(X > X1), P(X < X2), P(X > X2) or P(X1 < X < X2) in left, right or two tailed normal distributions. The data around the mean generally looks similar to the bell shaped curve having left & right asymptote tails both extends to infinity. Generally, 68.27%, 95.45% and 99.73% data observations fall around the mean between ±1σ, ±2σ and ±3σ respectively. The range of data or standard normal variate x lies anywhere between -∞ and +∞. μ - σ & μ + σ represents the left and/or right side attributes of distribution. A smaller & larger standard deviation values represent how the data is tightly or loosely bundled around the mean accordingly. The negative & positive values of Z-score lies on the left & right side of the mean of standard normal distribution respectively. The negative z-score lies on left side represents the left tail & the positive score lies on right side represents right tail of the normal or Z-distribution. By using this normal distribution table & calculator, user may estimate what is the probability of standard normal variate range in left, right or two tailed normal distributions. 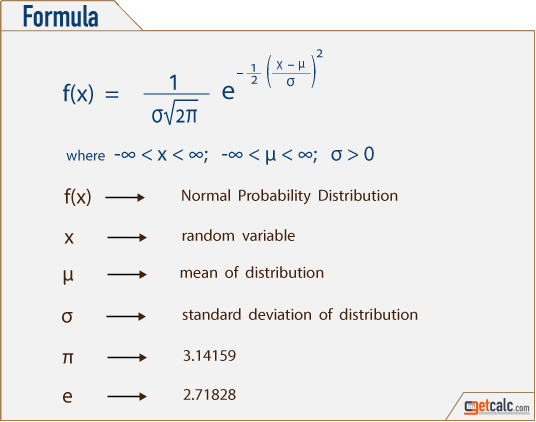 The below formula is the mathematical representation of Gaussian distribution to know what are all the input parameters are being used to find the probability of area of data range in left, right or two tailed normal distributions. Users may use this formula to find the probability of x-variate range, use the calculator to verify the results or generate the complete work with steps for normal distribution worksheet problems. Users may refer the below solved example problems with step by step solutions to learn how the input parameters are being used in the above formula to find the probability of range of standard normal variate in left, right or two tailed normal distribution. By using this calculator or formula, user may find what is P(X < X1), P(X > X1), P(X < X2), P(X > X2) or P(X1 < X < X2) in statistical experiments.